Bob has hijacked my You Tube channel. The Crumby Mummy has now been changed to Molly Bob Reviews. She is having lots of fun making videos and reviewing toys. We made a video about our recent London trip which is almost ready to upload. This week she has been reviewing the Fuzzikins Campervan Carry Case. I had never heard of Fuzzikins before but they sounded great. They are little animals with fuzzy skin, similar to Sylvanian Family fur. You can draw on them and then the colour washes off so you can create as many different designs as you wish. When the parcel arrived Bob & Bow had a great time making this video. I was unsure how well the pen would wash off. I was even more worried when Bob’s daddy drew on his face. I always thought it was the children that you had to watch! Luckily the pen washed off the Fuzzimals and Michael’s face really easily. 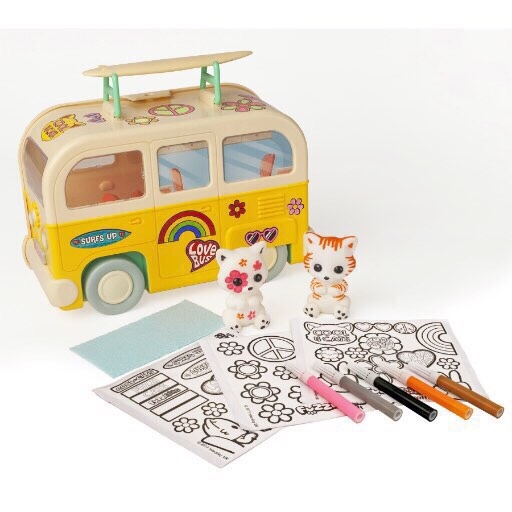 The set also came with lots of stickers that you can colour in and decorate the Campervan with. Bob really enjoyed designing the kittens and the Campervan. The Campervan has a removable surf board on the top which doubles up as a handle so that you can take you Fuzzikins with you on your adventures. They have already visited the park and soft play. I really like this set. It is unlike anything I have seen before and I love how you can colour in the Fuzzimals over and over again. I think that we will be having lots of fun with or Fuzzikins for a long time. Disclaimer: We were sent this set free of charge, in return for an honest, unbiased review.